Oh my! 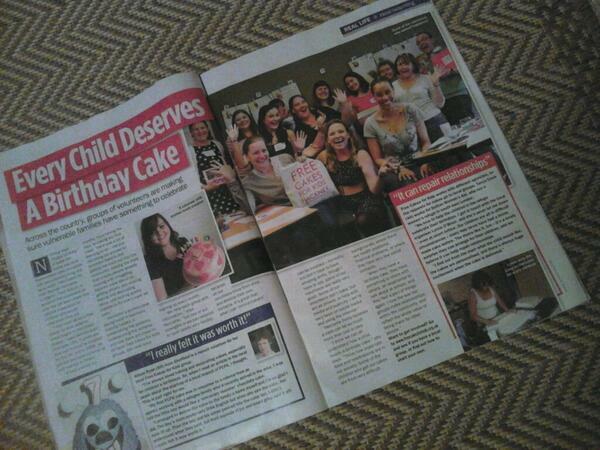 We’re in My Weekly! If you’re an avid My Weekly reader then you may have spotted this week’s article about the Free Cakes for Kids UK network. If you’re not, it isn’t too late to get a copy from the shops. We picked ours up from a rather helpful woman in WH Smiths yesterday so we know they’re still about. The keener eyes among you may spot a few FCFK Hackney faces (not to mention one of our stylish tote bags!) in one of the photos featured in the magazine. If you can identify us all then we’ll treat you to a muffin. Actually, we’ll push the boat out and get you a slice of carrot cake!